BILBAO BBK LIVE is Spain’s premier indie rock music festival. We have a pair of tickets to the 2013 installment to give-away to a lucky reader. The eighth edition of the Bilbao BBK Live festival takes place from the 11 to 13 July 2013 in the northern Spanish city of Bilbao. Depeche Mode, Kings of Leon and Green Day, Fatboy Slim, Biffy Clyro, Mark Lanegan Band, The Hives, alt-j, Klaxons, Soulwax, Two Door Cine Club and many more have been confirmed to play at the European festival. The festival takes place on top of a hill and surrounded by mountains, offering spectacular views over the city of Bilbao. Its proximity to the city and beach and a late start of bands, allow festivalgoers to make the most of this event and unique setting. Bilbao is a modern city famous for its architecture, museums and gastronomy, and it’s just a stone’s throw away from some of the best waves in Europe. Bilbao BBK Live is one of the highlights on the European summer festival calendar and its proximity to Pamplona makes it a favourite with the Running of the Bulls revelers. Above all, Bilbao BBK Live is a fuss free festival; with an uncomplicated layout, easy access from the city and airport; and an amazing price tag of just £85 + booking fee, for a three-day ticket including camping! 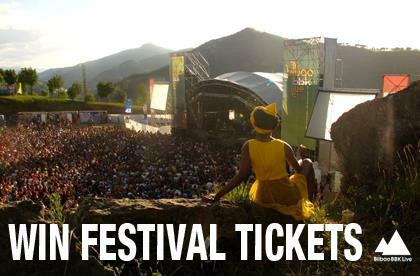 We have one pair of 3 day full camping tickets* to Bilbao BBK Live 2013 to be won. To enter, correctly complete the competition question and entry form below. Good luck! *Entrants must be 18yo+. Transport and expenses are not included (don’t be so greedy, you). The prize is the tickets only and cannot be transferred or exchanged. The winner must produce photo ID to collect the prize.